Glorieta Magdalena Davis Espinosa is happy that Papi married Alice. She’s happy that he can smile again after years of mourning Mamá. But the urn containing Mamá’s ashes disappeared into a drawer the day Alice moved in. If everything about Glorieta’s life is going to change, then she wants one thing to go her way: She wants to hear stories about her mamá when the family gathers on the last night of los Días de los Muertos. And that can only happen if Tia Diosonita will allow Mamá to be buried with the Espinosas in holy ground. If she will allow people to speak Mamá’s name. With the help of her best friend, River, and her cousin Mateo, Glorieta sets out to convince Diosonita that Mamá is not burning in Hell. To do so, she’ll have to learn to let hate go―and to love the people who stand in her way. In prose that sparkles with magical undertones, author Kersten Hamilton weaves a tender story about grief, faith, and the redemptive power of love. Glorieta Magdelena Davis Espinosa is proud of her family. When her father remarries after her mother's death, he puts away Glorieta's mother's ashes. Glorieta refuses to believe what her Tia Diosonita and others in her town say about her mother's eternal soul. Her goal is to get her Tia to let her place the ashes of her mother in the burial ground of her ancestors. With the help of her friend River and cousin Mateo, she goes on a quest to redeem her mother and in the process try to learn to love those who stand in her path. What worked: There's so much to love about this novel. First off, kuddos to the author for handling a sensitive topic-suicide of a family member-in a real and compassionate way. Glorieta deals with the town's long held misconceptions of the eternal state of someone who kills her/himself. In some churches this belief continues. Not only does she deal with this but step siblings who show up at her home. Her stepsister Lilith is not too nice and even does something horrific to Glorieta that shows the current plight of Mexican children who are rounded up by ICE. Those scenes in the internment camp are disturbing and haunting, but need to be addressed. Glorieta's old tias are in charge of Dia de los Muertos and the celebrations families have on that day to remember their dead. This is an authentic portrayal of how important this day is to Mexican American families. It's so much more that 'cute' skeletons. Readers see why Glorieta is so determined to get her mother in the graveside to be with her ancestors. I loved how authentic this novel is with showing the attitudes some hold against undocumented immigrants in this country. The depictions of la migra-immigration police-are very real. As a former bilingual teacher, my former student's parents would share what the immigration police did to those who fit the 'profile'. In DAYS OF THE DEAD, readers see this as Glorieta is mistaken for an immigrant. There's also some poetic beauty woven throughout like the kiss of the butterfly on Glorieta's cheek that reminds her of her dead mother. 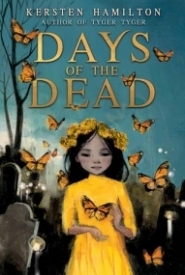 Magical, entralling tale of a girl who is determined to honor a promise she made to her mother and in the process learns to let go of the hate towards those who stand in her way. This addresses an issue that is very important today-immigration and one that should be discussed.